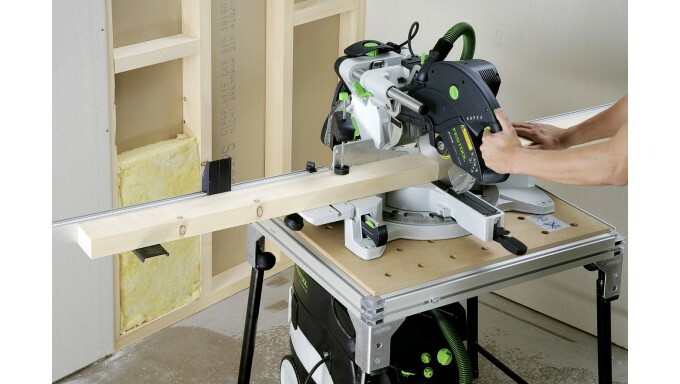 The Kapex remains the most advanced sliding compound miter saw available today, offering the capacity of a much larger saw in a portable, compact design. 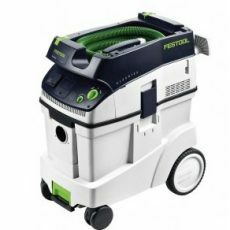 Unmatched dust extraction, simple adjustments and a host of time-saving features mean you’ll spend more time in value creating work and less time on work-arounds and cleanup. The ergonomically designed carrying position combined with its light weight (47 pounds) make the Kapex easy to move around the job site. 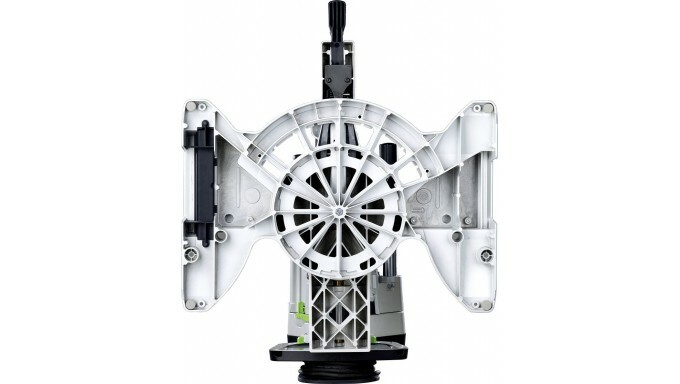 When being transported, the Kapex’s head is locked down making it compact and preventing movement. 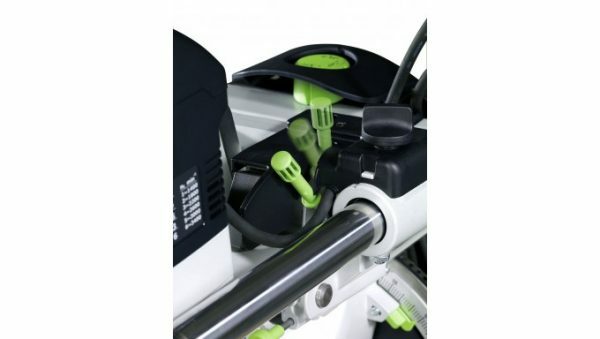 The two handle locations keep the center of gravity of the Kapex close to your body, minimizing the strain on your back. Now, that’s smart! 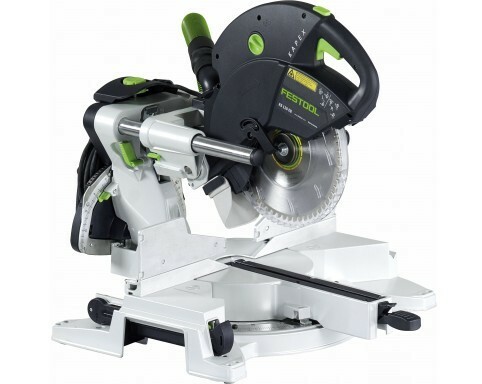 The Magnesium alloy base of the Kapex was designed to be extremely rigid and durable yet very light weight when compared to other 10″ miter saws. 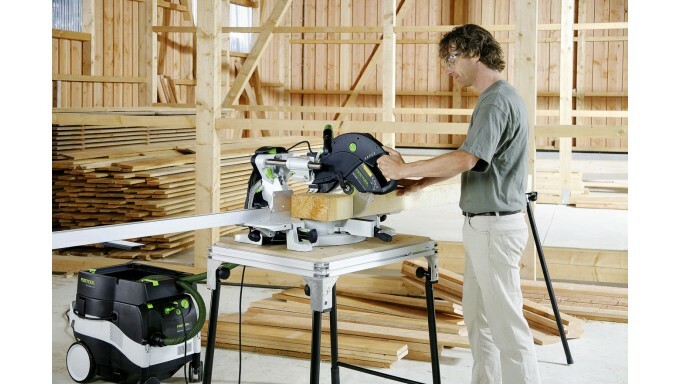 At only 47 pounds, the Kapex is truly a portable power tool. 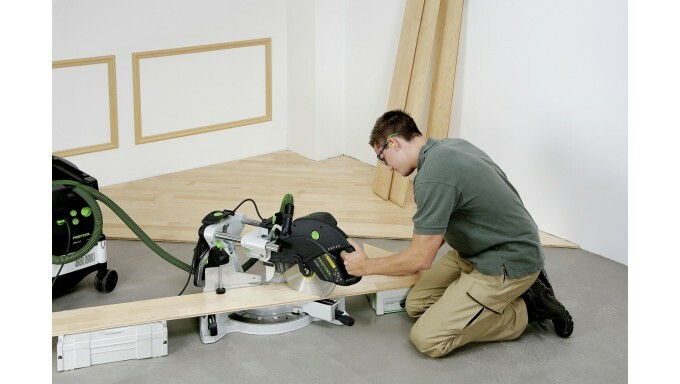 The compact footprint allows the Kapex to be placed against a wall when being used saving valuable space in your work environment. 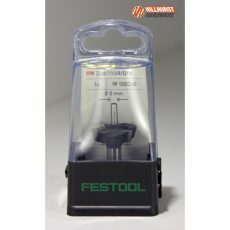 Rubber feet protect the work surface. 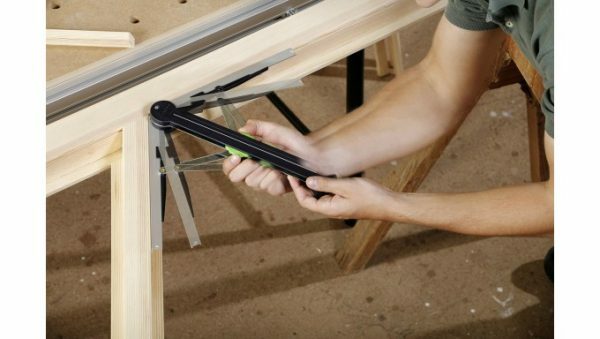 Use the Bevel Lock Knob conveniently located on the top of the Kapex to control the bevel positive detents and to lock the bevel angle. 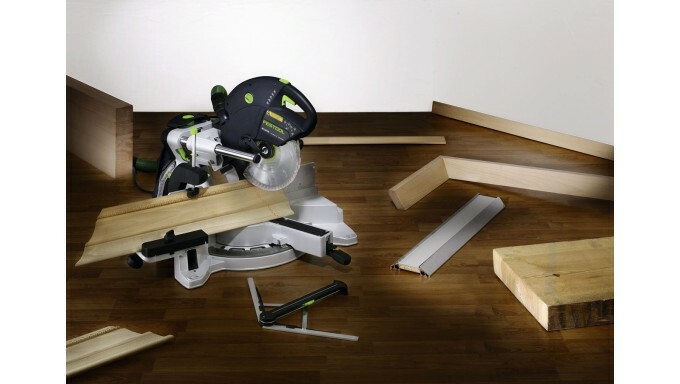 The counter spring balanced head on the Kapex allows you to position the bevel and let go of the saw with the head moving. Use the fine adjustment knob to control bevel angles in fractions of a degree. The bevel knob has three settings: positive detents at 0 and -45 degrees, free movement between -45 and +45 degrees and free movement up to ±47 degrees. 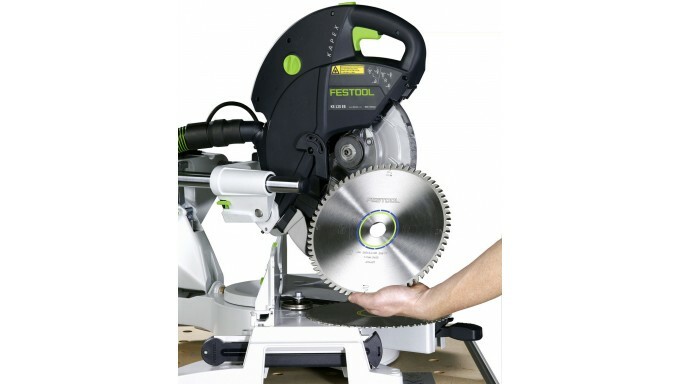 Bevels can be made to the left or right and the bevel gauge appears on both sides of the saw. 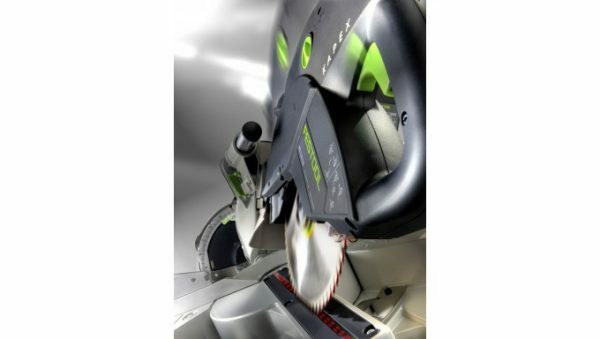 The Kapex incorporates a special cutting position that, when employed, provides greater than usual cutting capacity by utilizing the back portion of the blade more effectively. 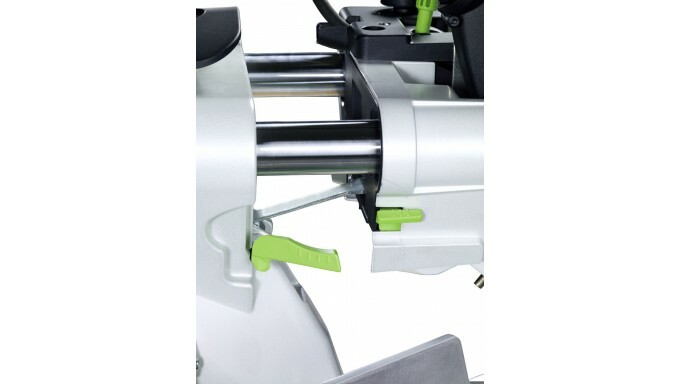 The Kapex is locked into the special cutting position with the flip of a lever. 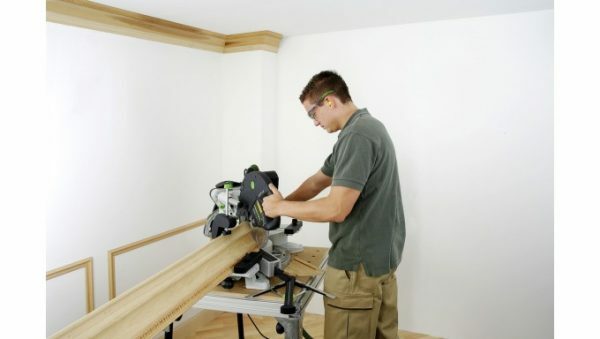 Cut crown moulding up to 6-5/8″ in the nested position providing a cutting capacity equal to some 12″ miter saws. 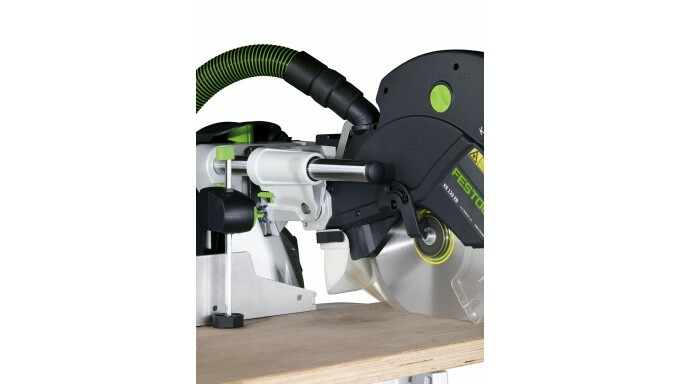 Cut material vertically up to 4-3/4″ x 3/4″ (as pictured). 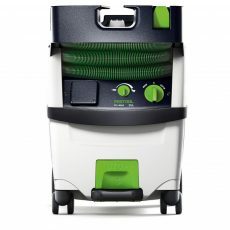 The Kapex features a swiveling dust extraction port which accepts a 27mm or 36mm hose. When combined with the Festool CT 22 or CT 33 Dust Extractor, the Kapex is capable of collecting up to 91% of the saw dust. The dust port has a swivel design to allow the dust extraction hose to be positioned. The Kapex features Festool’s patented FastFix blade change system. 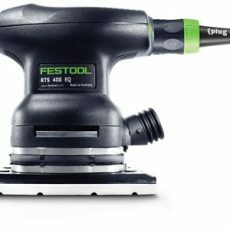 Turning the FastFix knob locks the arbor, mechanically locks out the trigger and allows the blade to be changed with a single hand. 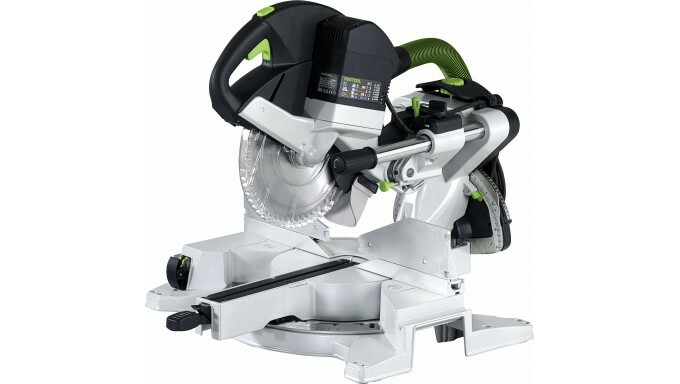 Blade changes couldn’t be any easier! A cupped steel arbor nut prevents accidental over-torquing and damage to the saw and blade. 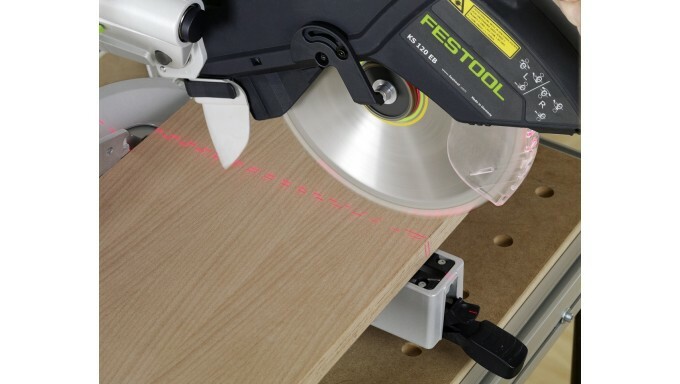 Easily align cuts from the left or right side of the Kapex using the dual lasers. The lasers clearly define the material which will be removed during the cut. Using the three axis adjustment controls, you have complete control to fine-tune the lasers. 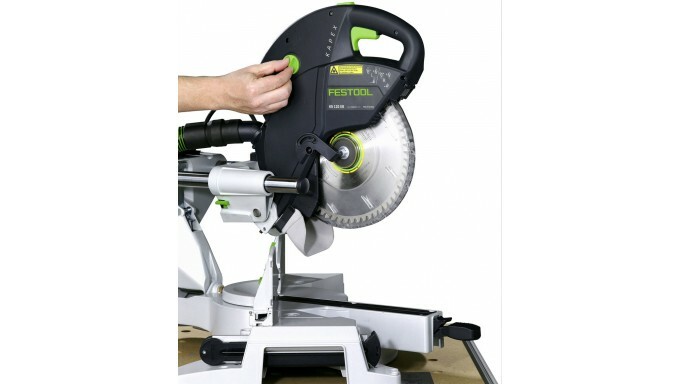 A conveniently placed button can be used to turn on the laser without powering on the saw. 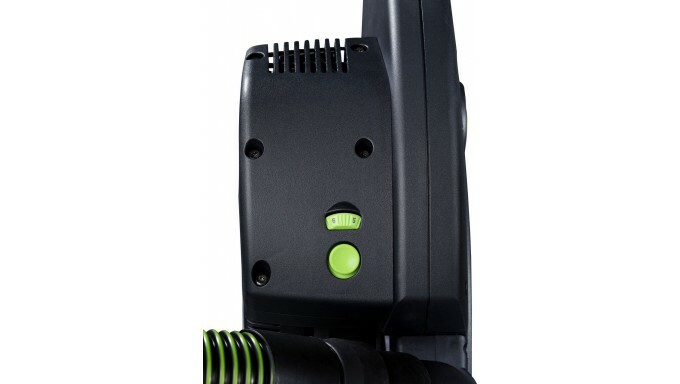 The lasers are electrically powered and require no batteries. 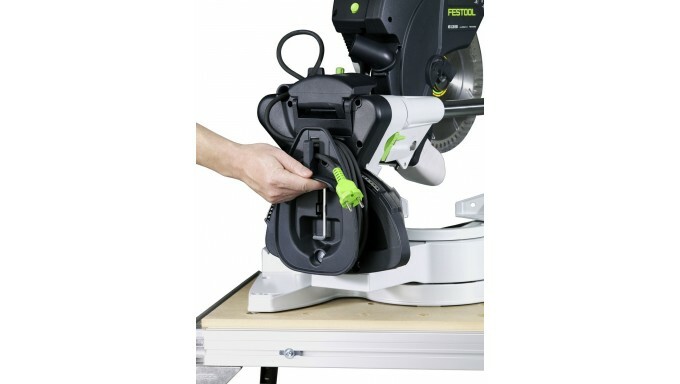 The Kapex features Festool’s unique MMC (multi-material control) electronics. 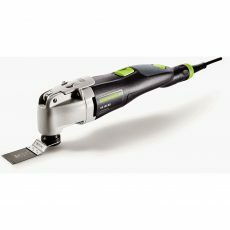 MMC provides constant blade speed while under load, provides variable speed control to match the blade speed with the material being cut and protects the motor from overload and damage. A chart on the side of the Kapex head provides a quick reference for the appropriate blade speed based on the application. 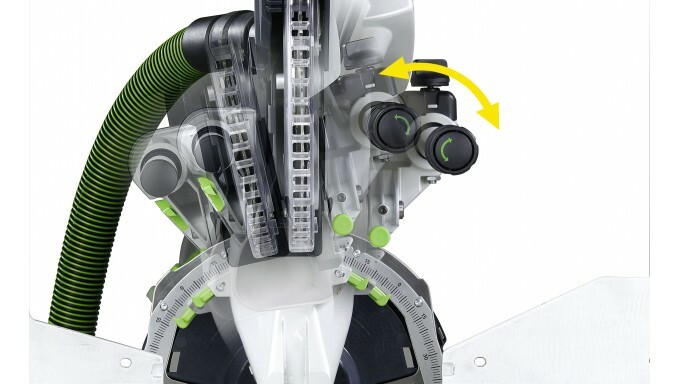 A dial just above the trigger controls the speed setting. Use the fine-adjustment knob to control the bevel of the cut to fractions of a degree with extreme precision. 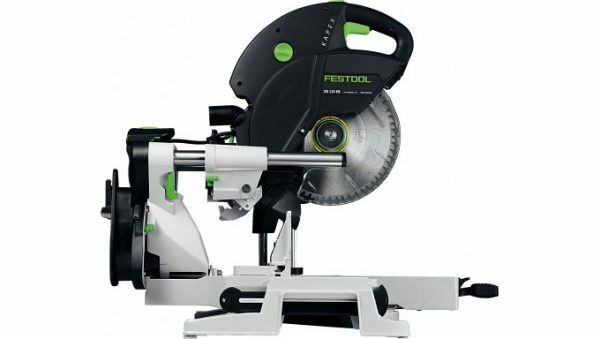 The knob rotates and engages a rack and pinion to move the head. The head is counter spring balanced which means that once you set a bevel angle it will not move before you lock it. 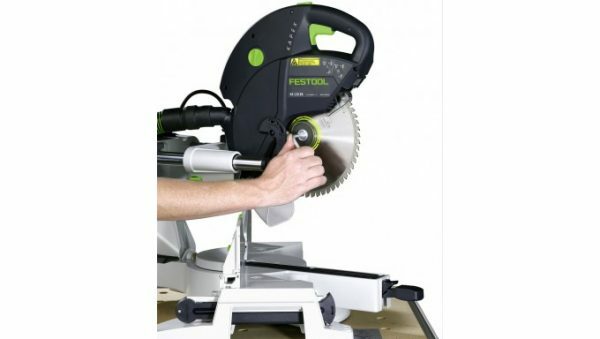 The bevel angle is very large and easy to read and the distance from the axis of rotation provides maximum accuracy. 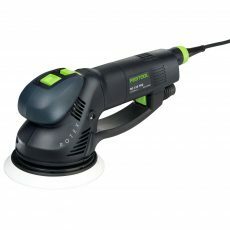 The 1,600 Watt motor in the Kapex utilizes direct drive for a more efficient transfer of energy to the blade. Festool’s MMC electronics control the application of that power in a constant speed as you make the cut. 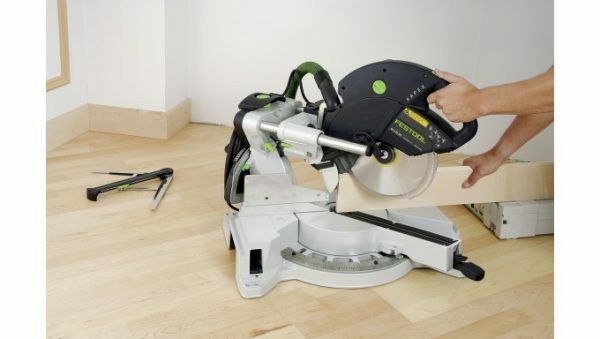 The result in a cleaner, more accurate cut than with a conventional miter saw. The motor also has a magnetic brake to reduce the time needed for the blade to spin down. Another unique feature of the Kapex is a special trenching capability. 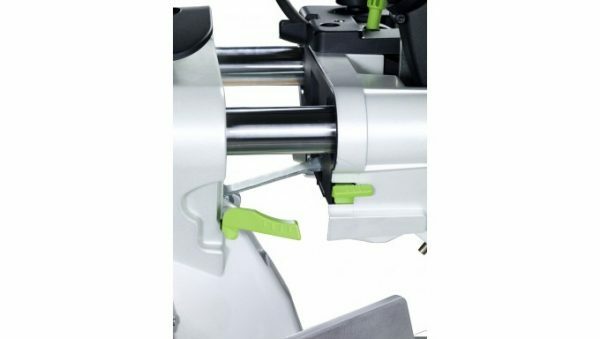 With the simple flip of a conveniently placed knob (shown in photo inset), you can cut trenches to create lap joints or go around pipes and other obstacles. 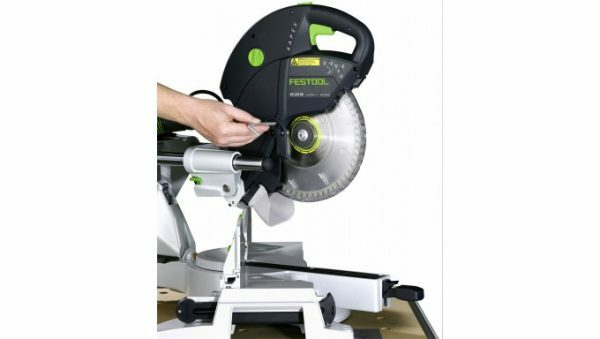 Flip the knob back up and you’re back to normal miter saw position in seconds. Turning the knob will adjust the trenching depth. 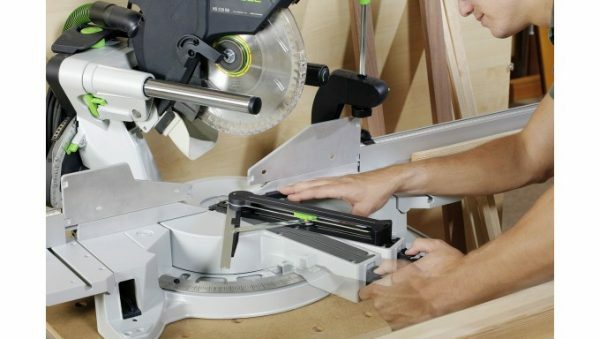 Make quick, accurate dadoes with your miter saw. Now, that’s smart! Sold as an optional accessory, the Crown Stop with Base Extension (494 369) attaches to the left and right of the Kapex using a V-Groove and locking knob providing additional support surface and aiding in the utilization of the special cut position. 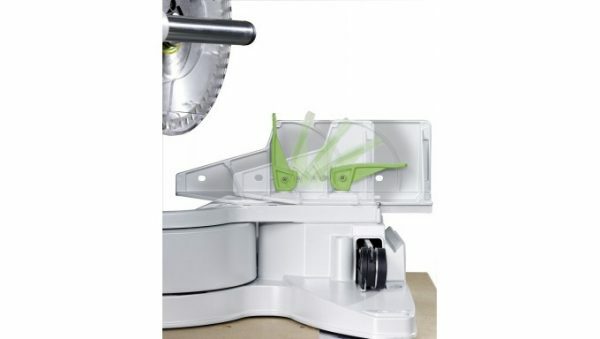 The crown stop (not shown in photo) allows the Kapex to be used in the special cutting position to cut crown moulding up to 6-5/8″ in the nested position using the back portion of the blade.